We don’t do Barbecues very well in this Country – We’re getting better at it and have come a long way from charred sausages and burgers which are still raw or frozen in the centre. But I think we’ve still got a very long way to go before we reach the standards of the US. 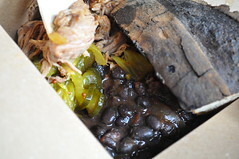 I mean, I remember the first time I ever had pulled pork with beans – I thought it was all about the ribs but that first taste of succulent, juicy pulled pork – topped with extra BBQ sauce and combined with the beans which were themselves sweet and smokey. BBQ has never been the same for me ever since. Thinking about it now, it’s probably the main reason I feel so meh about BBQ’s in this country and have yet to find anywhere that comes anywhere that offers food that is anywhere near as good at that first (almost magical) moment. There are a few places that come close – Bodean’s for example, but they’re still missing that something to make it special. So, when I first read about Pitt Cue Co. in Hot Dinners, it caught my attention. 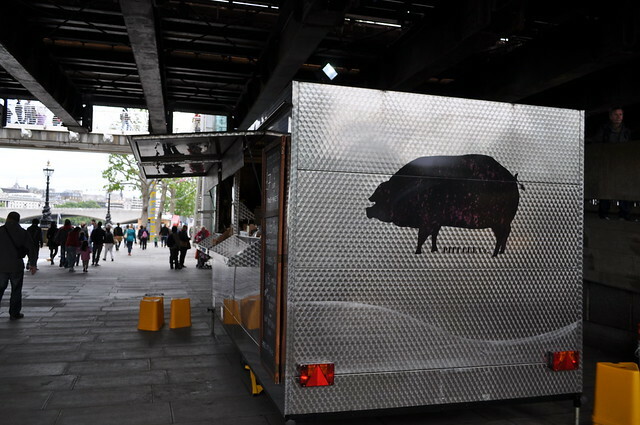 There are a growing number of food trucks offering BBQ – You’ve got The Ribman, Anna Mae’s Smokehouse, even Jamie Oliver has gotten in on the act and opened Barbecoa, but Pitt Cue Co. for some reason caught my attention more. You could call it a good vibe (or taken in by the pre-launch marketing schpleil), but for all the garble about founders Jamie Berger and Tom Adams (Jamie’s mother is from the Deep South of the US and Tom who is BBQ mad and has worked in the kitchens of The Ledbury and Blueprint Café), I was particularly intrigued by their offering of a Pickleback (with skin) – A shot of rye whisky or Bourbon followed by a shot of pickling brine (from their own pickles, of course) and the with skin option gives you some crackling, too. 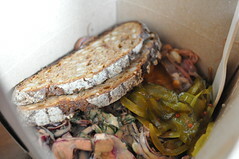 Booze, pickling brine and crispy pork skin – What’s not to like? Like I said, I had a good vibe about this place and wanted to try it at the first opportunity – Especially as in the short week or so that it’s been open, several other food blogs have already written about and so have pretty much cemented it’s position as a “must try” destination. That opportunity would be another trip to Londinium to see Cause Célèbre at The Old Vic theatre (which was very good) and we had about 30 mins free before having to head to the theatre to pick up tickets. As it happened, we were going to stop at the Real Food Market instead but I kept pushing to at least see where Pitt Cue Co. was so at least if we didn’t have enough time now, we would know where to find it next time we were in the area. We headed up the steps by the Royal Festival Hall and then down to the riverbank and below Hungerford Bridge which took all of 3mins, the site of the shiny trailer took us by surprise at first because it was *so close* but given we had about 20mins, we decided to eat there – Result! Unfortunately, we were too early for ribs (they wouldn’t be ready for a couple more hours) and the chicken didn’t appeal to any of us, so we opted for 2 pulled pork – one with coleslaw and one with root beer beans, and a pulled salt beef with coleslaw. YKL and Q went for homemade lemonade and me? I went for the pickleback with skin, of course. And how was it? It was pretty damn good – The rye whiskey was very smooth and the pickling brine both sweet and sour, but still retaining that smoothness and great counterpoint to the whiskey and there wasn’t an acerbic acid aftertaste. 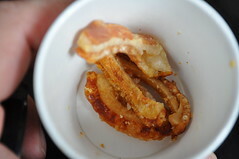 And as for the crackling, they were crunchy and flavoursome – Perfect to snack on. As for the rest of the food – Hands down the best pulled pork I’ve had this side of the Atlantic so far; the meat was tender, moist, smokey and the accompanying coleslaw was fantastic too – a perfect counterpoint in both taste and texture to the meat. 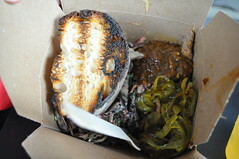 The pulled salt beef was again moist, juicy and full of salty goodness and the beans were rich and meaty (although I couldn’t really taste the root beer in it). 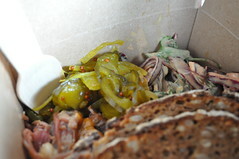 Oh, if they ask you if you want pickles and hot sauce, the answer is a resounding “YES” to both questions. Seriously, this was VERY good BBQ and very much deserving of all the praise it’s been getting on twitter and the blogosphere. 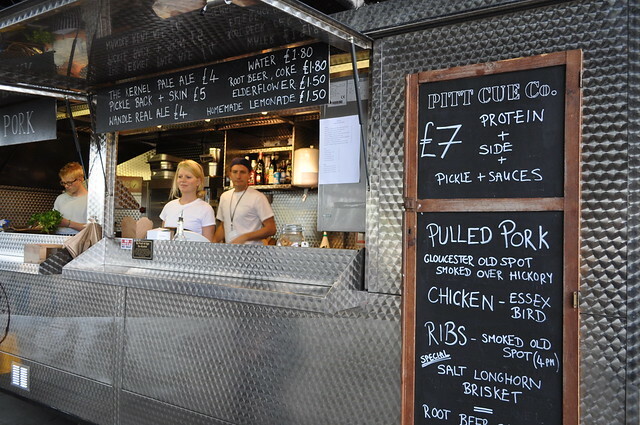 My only gripe was that each box costs you £7 and whilst you get a decent portion (no matter how small it looks) which fills you up nicely, the price tag is more into the Gourmet Food Truck territory than the whole ethos of street food not only being easily accessible but also relatively cheap. Don’t get me wrong, I’d happily go back again before the summer’s out but perhaps I’ll only go once or twice, not several times like I would if it were slightly cheaper. So yeah, do go – It’s certainly food you need to try at least once in your life, but whether you can afford to go as often as you want/like after that is another matter. But one thing if for sure: You *must* have a Pickleback – With skin. This entry was posted in Eating Out, Londinium on June 2, 2011 by YSL.